Why Do Slurry Pumps Experience High Wear at Low Flow Rates? If you’re an experienced slurry pump operator, you’re aware of some of the reasons for high rates of pump wear — which can negatively affect pump performance over time. Although slurry characteristics such as particle size and concentration may first come to mind, an often-overlooked factor in long-term pump wear is operation at low flow rates relative to the best efficiency point flow rate (BEPQ). But how does low flow rate contribute to pump wear? And what can pump operators do to avoid long-term effects? Flow rate is just one of many factors that affect pump wear life. Alongside temperature, speed, and power, flow rate — usually expressed in gallons per minute (gpm) — contributes to the overall head (pressure, as well as kinetic and elevation energy added to the fluid) that the pump produces. You can use a performance curve to determine the slurry’s optimal flow rate for a given impeller speed, known as the BEPQ. Although flow rate and head have an inverse relationship — that is, as flow rate increases, head decreases — determining and reaching the BEPQ can be easier said than done. Furthermore, the variety of factors affecting pump performance can make it difficult to determine precisely whether low flow rate is responsible for your higher rates of wear. 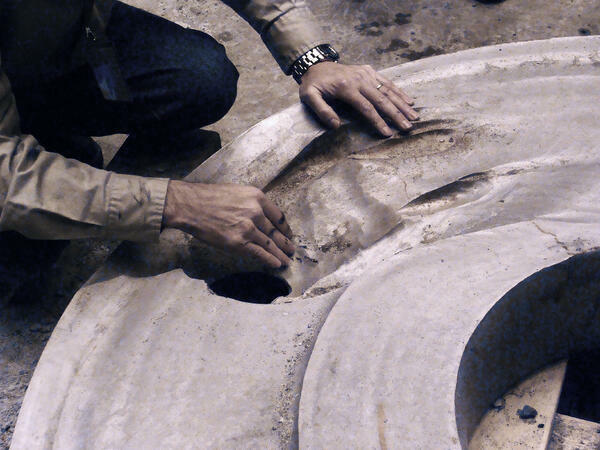 Particle size and shape, impeller design, and pump speed can all affect how much wear occurs over time. While high flow rates usually increase pipe friction losses and can cause their own types of pump wear issues, low flow rates can result in sedimentation and sanding in pipes, as well as low flow pump wear patterns. Low flow rates can result in pipe blockages and can cause a range of long-term problems, including reduced output, system stability issues, and even prematurely worn out pumps. When a pump is operating at a low flow rate relative to its BEPQ, a large amount of fluid recirculation is present within the casing and impeller, which results in highly localized gouging of the casing sidewalls and within the suction side gap. 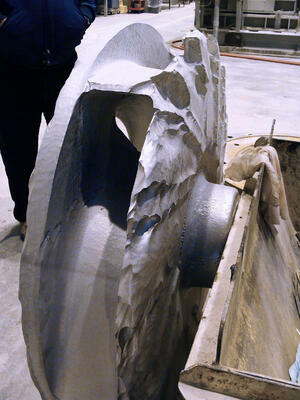 This type of wear often results in premature failure of the casing, impeller, and suction liner. Pumps operating at or near BEPQ usually experience minimal wear, which is more evenly distributed. Pumping slurries with especially abrasive or corrosive contents can amplify the wear rates, contributing to premature pump failure, inefficiency, and lost revenue. Increased part wear means frequent repairs and increased downtime, which inhibits your ability to pump slurry and make money. Since wear has a variety of telltale signs, it’s often easier to detect than the factors that contribute to it. This means that the effects of low flow aren’t often resolved until it’s too late. Fortunately, there’s hope; with due diligence and a little help, pump operators can avoid the negative consequences of low flow rates, such as high wear. Determine your BEP(Q). Your first line of defense against wear and other problems is to operate at or near the BEPQ. Ensure the pump operates at the point on the performance curve most optimal for the pump’s design. The BEPQ can be determined through examination of the pump’s sales curves. Make regular inspections. Your next best tool is a set of trained eyes. By making scheduled inspections of your pump site and checking for signs of wear, you can avoid long-term consequences. Use the right pump. A common reason for flow rates far from the BEP, and by extension the associated low flow pump wear, is improper pump selection. Make sure your pump is the right one for the system, fits properly, and is optimized for your pumping operation. Selection of too large a pump for a given system will result in low flow rates with respect to the BEPQ at a given speed. Monitor the flow rate. Measuring the flow rate with instrumentation is important to ensure that the flow rates experienced in the field are within the desired range of flow rates for a given pump in a given duty. See the ANSI/HI Standard for Rotodynamic (Centrifugal) Slurry Pumps for more information on the desired range of flow rates for pumps in various duties. Flow rate is just one of many factors that impact pump wear life, and hence determining where and how quickly flow causes wear isn’t always easy. GIW engineers at the Hydraulic Lab test a wide variety of slurry types at different flow rates and duty points. GIW offers a range of slurry pumps designed for flow rates between 100 gpm and 100,000 gpm and beyond, so you’re covered no matter what or how much you’re pumping. Long-term wear and tear can spell trouble for any pump owner. Luckily, GIW experts are here to help. Get in touch today.